When it comes to personal agendas, there are few who are as laser focused as this man. Initially endorsing campaign pledges by Trump committing to increased accountability at the VA, his European trip—for which taxpayers paid $122,334—involved more sightseeing and shopping with his wife than “official” government activities. When the Washington Post first reported this story, Shulkin assured the public "nothing inappropriate” took place. The Inspector General’s report also found Dr. Shulkin had inappropriately accepted tickets to Wimbledon worth thousands and had directed an aide to act as a "personal travel concierge" for the trip. In his op-ed piece, he feigns ignorance, “I am a physician, not a politician.” Based on my personal experience, this is a classic tap dance move by the man who should be known as Dr. Wimbledon. He closes his disingenuous opinion piece with “it should not be this hard to serve your country.” Actually, Dr. Shulkin, it IS hard, very hard. You are not a veteran yourself, so how could you have any idea what it is like on the battlefield? While selling the notion you were fired for your stand against privatization, that is hardly what happened now is it? You did not act with “the utmost integrity” in support of the 20 million U.S. Veterans. You were charged with fixing a dysfunctional system built to serve a population who have devoted their lives to teamwork and sacrifice. Our veterans deserve better than the healthcare currently being provided to them. 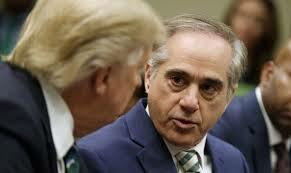 While some vilify President Trump for his decisions, let me assure you that firing Dr. Shulkin from a position he should not have held in the first place was great for America – and our veterans.